Mutual Learning about how to "bridge"
Employment and Inclusion strategies, actors and actions through social economy experiences. The project Bridges for Inclusion will address the recognised need of more concrete strategies and action for the reinforcement of coordination and interaction between Employment and Social Inclusion European strategies. The Bridges for Inclusion’s final product - Guidelines for Bridging Employment and Inclusion – is available in our section “Documents”. Download this product and get to know key challenges and recommendations to bridge inclusion and employment. 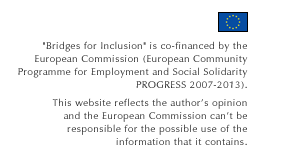 The 6 National Overviews on Employment & Inclusion (from Belgium, Bulgaria, France, Portugal, Romania and Spain) are available in english versions in our section "Documents". Take a look! The European Overview on Employment & Inclusion is now available in 5 languages (Bulgarian, English, Portuguese, Romanian and Spanish). Take a look in our section "Documents".